Wow… what a ride! A couple weekends ago was graduation at UMD, and I got to walk the stage, grab my diploma, and shake Chancellor Black’s hand. With commencement come and gone, it is time for me to turn to the next chapter in my life, and I am very excited. Over the last four years, I have been proud to call Duluth my home, and the appreciation I have for our community here at UMD seems impossible for me to put into words. Overall, it has proven to be some of the best years of my life, and I am forever grateful for that. Before I officially tip my hat, I think it is best to pass along some of my own wisdom and advice for fellow Bulldogs! So, here it goes. This time in your life is all about being involved! Find an on campus job, volunteer in the community, join academic clubs, participate in intramurals, and start planning that trip to study abroad. All of these things have been a part of my story as a student here at UMD, and they have truly been what have made it something special. By involving yourself outside of the classroom, you are able to meet new people, try new things, and most often learn more than you would from any textbook. Remember to look for these activities and seize the opportunities. Sounds ambiguous, but it is very simple. You should always be looking for new things to do. How else do we keep life entertaining? Whatever your commitments are, classes or work, remember to schedule time to go to that hiking trail you have never been to, that comedy show you have always wanted to see, or even start laying the foundation for that trip to Europe you have always wanted to do. If you don’t now, will you regret not taking those opportunities years from now? No matter the case, make time to be adventurous and outgoing, and explore places you have never been before. Growth happens when you push yourself. Push yourself outside of your comfort zone, and I promise good things are bound to happen. Stress will always be a part of life, so don’t let smaller things get in your way. Not only that, but there are excuses for everything, so don’t let those minimal arguments deter you from doing something you have always wanted. Excuses are usually to avoid failure, but failure is what helps get you to success, so don’t be afraid to make mistakes. Challenge and change should always be a part of your life. It’s what gives you independence and confidence for the future. With all this chaos, always remember to stop and take a deep breath. Life is busy, life can be overwhelming, but life is great! Find your favorite spot on this planet, outside or in, and take a break. Leave your phone and laptop at home, and just do some good ol’ fashion thinking. Where have you been? Where do you want to go? How do you get there? They are definitely things we think about everyday, but do you ever take the time to build yourself a personal road map? Goals are better achieved when there is a strong plan and path to get to them. Above all, I want to say thank you. Thank you to those that have helped shape me into the confident young lad I am today. I will miss UMD greatly, but with the skills and tools the university has given me, I am confident I will make a positive impact on this world! When it comes to dressing for success, what does it mean to look the part? If you are meeting with a professional to do an informational interview, going to a job shadow, or are doing a Skype video interview, what is the best dress? In this brief blog post, I am going to break down the appropriate dress code for a variety of professional settings with the exception of normal job interviews. You can check out Ashlee’s post from yesterday for a break down of how to dress for interviews. Most often we can think of informational interviews as being a formal event. Just like a normal interview, it is important to dress to impress. Though the format of the interview is for you to ask questions and learn more about their job, they will be taking note of you as well. In most instances, it is best to dress as if you were going for a normal job interview. Gentleman should be wearing suits and ties, and the ladies have a little bit more variety with blouses, blazers, skirts, and pants. Remember to be genuine and sincere in your questions! Show that you have interest in their career and that you appreciate their time. When they see your professional dress and energetic personality, you should be a shoe-in for that open intern position this summer! What to wear to the job fair, that is the question! And the answer is easy, as you should always plan to dress business professional. 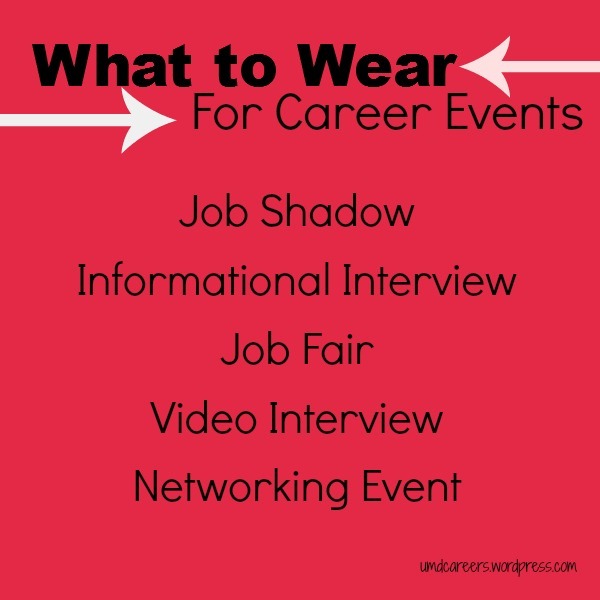 By the time you reach your junior and senior year and you are seeking internships and full-time employment, it is important to look your best as you chat with prospective employers. Job fairs are the first interaction you have with many of the people within an organization you may be interested at, and remember that first impressions are very important. Suit and tie for gentleman, and blazer and blouse work best for ladies. Now, if you are a freshman or sophomore and attending a job fair, you may have more interest in just meeting different professionals, learning more about industry, or even getting a feel for different companies that are out there. For you, it may be appropriate to be wearing a button down shirt and tie as a male, or a button down shirt or blouse for females. Ultimately, remember to put your best foot forward at job fairs, and I promise that looking the part is a big key to succeeding. There may be a variety of reasons your are asked to do a Skype or video interview via your computer, but no matter the context of how you are meeting the interviewer, it is still important to look the part. Video interviews are the same professional dress code as any other in person interview, with the exception that pants are optional… I’m kidding, I’m kidding! Please wear nice pants even though the camera will only show waist up. It may be funny to tell you friends that you have been to an interview in your briefs before, but I just can’t imagine anything good happening from that! Anyway, not only remember to dress professionally, but take note of your background. What is behind you? Is it a window, a plant, a television, a wall, your childhood bunk beds? No matter the location of where you are at, make sure you are in a private room with no other people to distract you. Public places like coffee shops and malls will not do. Find a good neutral background like a wall, and make sure to test lighting and sound before the interview begins. Once your computer is set up, you look as sharp as a tack, and you are ready to meet, you are on your way to success and hopefully a second, in-person interview. Networking events, though similar to job fairs with large populations of people, are not always the same for dress code. Depending on the status of the networking event, it may be okay to throw on a blazer and slacks with no tie, or possibly a collared shirt with a sweater. Overall, a networking event may prove to be a bit more casual as many of them happen outside of business hours. They could be over the weekend, or over happy hour, but most often you will want to balance being comfortable and looking professional. My suggestion for these events is to be classy, but be you. Add a bit of personality with your clothes by wearing fun seasonal colors, patterns, and textures. As a gentleman myself, I am a fan of a textured grey sports coat with colored stripped shirt, and comfortable slacks. If you stick with these rules, you are guaranteed a mission success! Hopefully this quick talk on professional dress answered some of your questions! If you want to get any more information on any of these types of professional settings, remember to skip on down to Career & Internship Services where a Peer Educator or Career Counselor is ready to help! Thanks again for tuning in, and talk you soon. In today’s job world, now more than ever, it is important to be active and relevant online. It is no longer enough just to have a LinkedIn profile with minimal education and experience information about yourself, but it is crucial to have an online presence in order to be noticed and reach personal career goals. How do you do this, you ask? It’s easy! LinkedIn Pulse. This is an application that can not only be found at the top of your news feed on LinkedIn, but it can also be downloaded as an application on your phone or tablet. LinkedIn Pulse is an integrated news application that is tailored to your personal preferences. When first setting up your Pulse preferences, you can select from a wide variety of news and industry topics such as: Accounting, Business Travel, Big Ideas 2014, Design, Education, Entrepreneurship, Media, Oil & Energy, Professional Women, Technology, or even Things I Carrey. The point is, the list is endless! Once you have selected your top news and industry sources, updated information on these topics is fed to you on your news feed. Now I know what you are thinking. How does this help with my online professional presence, and more importantly, what does this have to do with advancing my career? The answer is everything! LinkedIn Pulse can help you stay relevant in your industry, and more importantly, it gives your great conversation topics to share with other connections and groups. On LinkedIn, it is important to share topics and contribute to conversations, not only because it gives you more visibility, but also because it is important to remain “human” while our society continues to move towards online platforms as a means of connectivity. Here are some quick tips to remember while conversing on LinkedIn! It is sometimes difficult to find good articles that may add value to someone’s day, as national news is already front page. Dig for news that is from your local area! These stories tend to get more response from personal connections. It can be easy to hit the share button on anything that seems interesting, but remember to put some thought behind it. By sharing more interesting topics, you will engage more people. Who else may want to see what you would like to share and why? Directly involve them in the conversation, and ask for their opinion. If it is not professionally appropriate, or does not necessarily apply to the professional persona you want to have, maybe save it for facebook. It sounds like it is tough, but many times people can still see through sharing articles and news just for sharing sake. Overall, LinkedIn Pulse is an amazing resource to use as it can help to create conversation and engage deeper thought through news and industry articles. Take a look around this application and see how you may be able to use it to its full potential! Stop by our office, SCC 22, for more information or help with the application or anything else LinkedIn. When it comes to even the thought of studying abroad, there seem to be some students who get deterred from the idea because of a variety of different factors. Getting the opportunity to go global is not only highly beneficial to your career and personal self, but there is only a limited window in your life where you will have the opportunity to spend a long period of time in a different country. For this short post, I want to break away a bit from our normal career focused material, and share more about the believed barriers to studying abroad. My goal is that the information I pass along about study abroad comes full circle. This is an opportunity that platforms you for success after graduation and creates a invaluable connection to personal career aspirations. So let’s get to it then. The real question is, “why are more students not taking advantage of study abroad during their time at UMD?” It is the University of Minnesota’s goal to have at least 50% of students take a global experience before they graduate and only 3% of UMD student do! So why is that? I want to address and explore the three main concerns I have heard from students about why they decide not to study abroad. 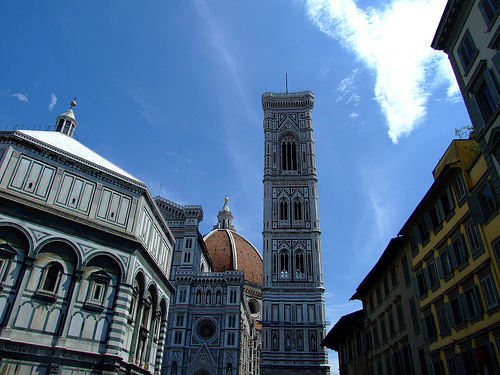 Indeed, the cost of one study abroad program may vary from another, yet you may surprisingly find that there are some programs that are less of a cost than a semester at UMD! No matter where you choose to go, the biggest financial factor to take into account is cost of living. Places in Europe may prove to be a bit more expensive when buying your loaf of bread at the store verses places in South America. The main thing to remember when planning your study abroad experience is that if you currently have financial aid, it is possible to have this aid rollover to the program tuition fee. Not only that, but UMD alone awards around $90,000 each year in scholarships to students studying abroad! There are many penny saving plans that will help you reach your study abroad destination, but the key to success is to do your research and develop a budget. While students with history, political science, language, and arts majors may find it easier to transfer classes taken overseas, that does not mean you won’t find classes for your criminology, health education, or even anthropology major. When it comes to planning your study abroad experience, it is important for you to do a bit of digging and research on what universities or programs will have classes you could take to stay on course for graduation. Remember that universities overseas also have majors and fields of study, and they also have classes to focus their studies around. After you have narrowed down a few locations, take a look at which universities offer classes you may need. At the end of the day, remember that the point of studying abroad is to think outside of the box and explore other interests that you may have never thought of before. Fill those upper division liberal education classes you still need in the history or arts. I took an Architecture of London course and took field trips to buildings across the city throughout the semester in England. I can say with certainty that this is not offered at UMD. Take a look at what UMD students have already taken while studying abroad and have gotten credit for. Just like before, it will take a bit of searching to find the best programs to fit your major, but ultimately, I promise there is a program that fits for you. Anytime between sophomore and junior year is the time to take advantage of a global program, however, don’t write yourself off even as a senior. There are plenty of opportunities as an upper division student not only to study abroad, but even international internships, volunteer work, and UROPs as well. When it comes to the application deadline, normally you will apply mid-way through the semester in advance of the one you want to be away. And if you procrastinate every once and awhile, like me, this still gives you a good amount of time to get all your ducks in a row before you leave. If a full semester over seas is just not for you, or you truly can’t find any options that allow for a clean transfer of classes, look into the UMD short-term programs that can take you around the world over a winter break or summer break, as there are plenty to choose from. Now there should be no excuse for you too say its too late. It’s as easy as landing your finger on the globe and packing! All-in-all, I hope my short blurbs on studying abroad continue to interest you and provide great insights, as I truly want every student to have the same experience I had. The goal is to travel, learn, and grow. Push yourself out of your comfort zone every once and awhile, and I guarantee you will be happy you did so. Taking advantage of an opportunity like such is not only beneficial to skill development and career advancement, but it is an experience of a lifetime that provides priceless personal growth. 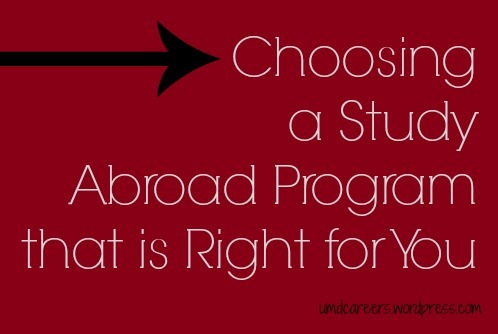 During your time at UMD, take advantage of a resource you may never be able to use after graduation and study abroad! With the changing of the seasons hopefully just around the corner here in the Northland, it has many students thinking about change in their own life, myself included. Before we know it, another semester will be tacked on the board for most of the students here at UMD, but for a good few, it will be time to graduate and turn a big chapter in their lives. The achievement of graduating from university is huge, and all upcoming grads should be proud of what they have accomplished here at UMD! Networking, networking, networking! You will be amazed at how this element to the job and internship search will send you leaps and bounds above the pack! So now you are asking, “Where do I start?” and “What should I do?” Job fairs and networking nights can always be a powerful medium to networking, but as you get more serious about your job search, there may be a more personal and successful way to meet and talk with professionals in your field of interest. This can be done through informational interviews! Informational interviews can truly be the first step in landing a dream job. Not to get ahead of myself, let’s start at the beginning. Though informational interviews have great potential of sprouting possible job opportunities, that is not their intentional purpose. These are conversations you initiate with professionals in your field of interest in order to learn more about what they do and the industry as a whole. These meetings help you learn more about your career of interest while also building an important professional relationship with someone that may have the power to bring you on to the team later on. Search your field, and look for professionals that may be interesting to talk to. They may have a career path that interests you, or they may be employed by a company you would love to work for. This can be done with a quick Google search or better yet, through LinkedIn. Just send them a message and see if they have time for some coffee and questions, and most people are glad to share their story and insights with you. Just remember to communicate professionally, dress nicely, and show true interest and appreciation with the relationship you build. For more information, we have great tips and advice in our UMD Career Handbook about informational interviews, so stop in the office and chat with a Peer Educator or check us out online to get more details! Thanks for tuning in! For most of us, our venture off into the “real world” is approaching sooner than we think, and it is time to update the resume, polish up on interviewing skills, and above all, market our amazing skills to prospective employers! Standing out on paper always seems easier said than done, but what can we do now to set ourselves up for success in the future? In this brief post, I am going to share with you ways in which study abroad experiences can help you separate yourself from the pack when it comes to job and internship hunting. I hope this proves to not only be a good read for students that have already studied abroad, but also for those of you who are even slightly interested in taking that international leap to learn! 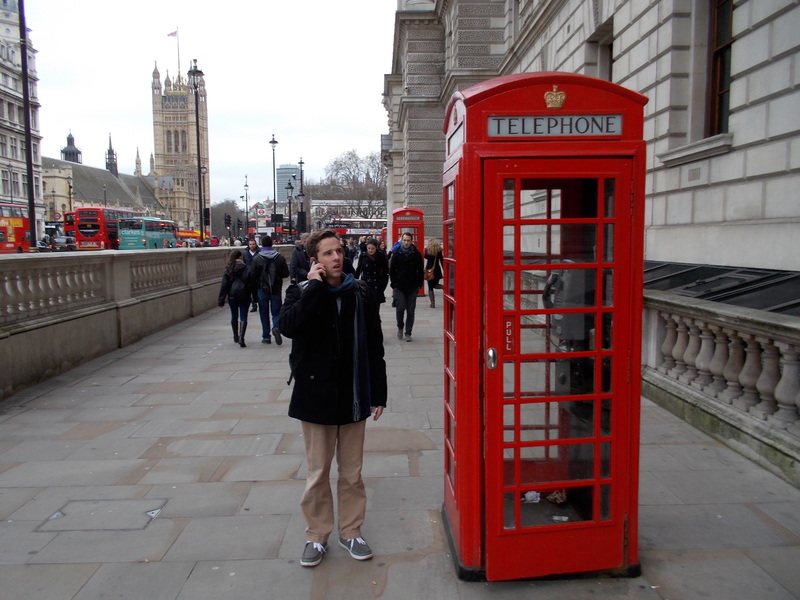 When I had returned from my semester in London, many people were curious about my travels. I definitely enjoy sharing these stories with all those that are interested, but all these questions soon started to get me thinking. “So… how have I changed?” and “What did I learn from my time overseas?” It’s always easy to talk about the different places I have been and the adventures I went on, but how do I share the skills I developed when it matters most? More and more employers are not only seeking out students in the right field, with the right grades, and the right school, but they are looking for students with passions, ambitions, involvement, and experience. Standard and simple! Slap the study abroad experience on your resume. It’s best to keep this one short and concise under the Education section of a resume. Sometimes it feels like it would be nice to give this type of experience a whole page to itself, but unfortunately that’s not quite how resumes work, and I bet the employer at the other end will have more important things to be doing. Under the education section of a resume, it is as easy as listing the program or school you attended while abroad, location, and maybe GPA info if you care to put it. Our Career Handbook in our office has some good examples on how to add study abroad to your resume, so head on down and take a look when you can! When it comes to a cover letter, just like any other shared experience, we are able to elaborate more than on a resume. This is where you are able to share those life changing experiences and skills you gained while abroad. For me, it is still important to tie in my academic work and group projects from the school I went to in a cover letter. In doing this, I am able to explain the projects and assignments I worked on, and also talk about things such as different team or report types. If done correctly, your cover letter will highlight your new independence skills and also show your ability to be adaptable, flexible, and truly how to perform well in other environments and settings. Last but definitely not least, interviews are going to be your best opportunity to share with an employer the skills you gained while studying abroad. From my experiences this past semester, I have brought up my semester in London when asked questions about greatest achievements and even biggest obstacles and failures. And crazy enough, that is really what the whole experience is about! It’s about overcoming challenges, finding paths for yourself, and creating goals and dreams. Just have a couple stories ready to tell before you head in for an interview, and I even bet most of the nerves will melt away when you are asked a question about your travels. This is because they are fun to talk about! Try not to go on too long, and make sure you are answering their question and coming to a point. Overall, my experience in interviews has showed me that the natural excitement I get when I talk about studying abroad seems to go a long way in the eyes of the employer! Ok, ok… I promise I am off my study abroad “soap box” now, but if I can say one last thing, it would be that if you have the opportunity to study abroad during your years at UMD, do not hesitate to take it. There is something exciting and almost indescribable about taking an adventure of your own, stepping out of your bubble, and discovering what else is out in our big world. If you have any other questions about studying abroad, make sure to stop by the International Education Office where they can answer your study abroad questions! Or if you would like to just come chat about any travel opportunities and how to incorporate them into your job search, come steal me for five minutes at Career and Internship Services. Talk soon, all! So you are thinking of studying abroad? Well, you are in the right place! Is this true, or did I just catch you off guard? Well it’s too late now, and you have successfully been sucked into reading my blog post for today! (Attention-getters work just amazingly, don’t they?) Anyway, today I am going to talk a bit about studying abroad and finding the right place and program to best fit you. First and foremost, it is always important to mention what a significant impact studying abroad has on a resume! It shows your passion for learning and development, illustrates that you are personable and welcoming of new people and cultures, and above all, demonstrates your independence and personal confidence. After being selected as the hiring candidate for a marketing internship this past summer, I can tell you first hand that the experience I had overseas put me above and beyond the competition. It seems pretty simple, but you would be surprised how often this can get overlooked. When I talk about “meeting your needs” I mean making sure that you are taking courses or doing internships that keep you on track to graduate on time or help to develop professional skills. If you are thinking about going for the semester or even year, it will be important to map out the classes you need to complete before graduation. Take note, however, studying abroad provides an amazing opportunity to fulfill liberal education classes that you would otherwise not be able to at UMD! Perhaps you want to take Marine Biology in Australia, Art History in Italy, or Architecture in London. Ultimately, there is no better way to learn, than to do! Most importantly, remember that UMD’s International Education Office has a Course Equivalencies list of all classes that have ever been taken abroad by UMD students. It’s best to cross reference this list when looking for classes abroad. I know what you are thinking… “duh, Zach! The whole point of studying abroad is to travel.” Location is key when planning your study abroad adventure! It’s crazy to think, but I could guarantee that you could put your finger on the globe give it a couple spins and find a study abroad program where you are pointing. I have heard from some UMD students that they decided not to study abroad because UMD does not offer programs they are interested in. Well I am happy to tell you that you do not have to only select from the programs UMD offers! You can select from programs across the nation from the UMTC campus, third party sponsors, other universities, or you could even open enroll in the school or program you are interested in abroad. If you are interested in studying abroad, my suggestion would be to think about the location first. If you have your heart set on a specific location, but UMD does not offer a program there, you may just have to do bit of research and digging to find one that fits you. I know it’s not right to give open-ended and redundant advice, but this statement is so true! When you have found a program that meets your academic or internship requirements, and you have decided on the location of your dreams, the rest just seems to fall in place. Of course there is some paperwork with applying to programs, but don’t let that deter you! For me personally, I was always excited to fill out paperwork for my study abroad program because it meant I was getting that much closer to going! Overall, once you make that connection between the program and location, there is not much else to determine. Hop on that plane, and get a move on! When planning you study abroad endeavors, remember to stop by our office at Solon Campus Center 22, as we can help show you ways in which to develop professional skills during your travels. UMD’s International Education Office can help you find programs and classes that will work within your major, as well help you with the application process. If you ever have any questions about study abroad, feel free to stop by and chat! I look forward to seeing you soon!